This is the first year that I didn't go to the usual meeting place (Sunami Ferry in Mihara) by bike and I'm so glad I didn't because it was way too cold this morning! Pei-san and myself, with Wakadana behind us, arrived early with time to spare. 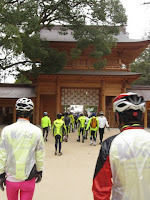 About 30 members gathered for today's ride from Setoda Port on Ikuchijima to Ōyamazumi Shrine on Omishima. But before the hilly route began we met at the Tatara Service Center to regroup for a picture and some food! As the rest of the group took off ahead, a few of us followed behind and enjoyed the scenery at leisure pace. After a delicious lunch, we headed to the shrine to pray and buy various lucky charms for health, success, safety and others. Most of us bought helmet lucky charms for safe cycling! On the way back many of us stopped by various shops to eat roast chicken and korokke. Others bought mikan and senbei, too! Overall it was a great ride with the team! Can't wait to do it again! Yeah! Let's go ride and eat some good food! Thank you for today's cycling. It was enjoyable day today! Let's enjoy cycling, eating delicious foods and drinking "TANREI GREEN LABEL " this year too. See you next cycling time! Haha. Yeah, I always drink GREEN LABEL.. It's cheap and good! See you on the road.